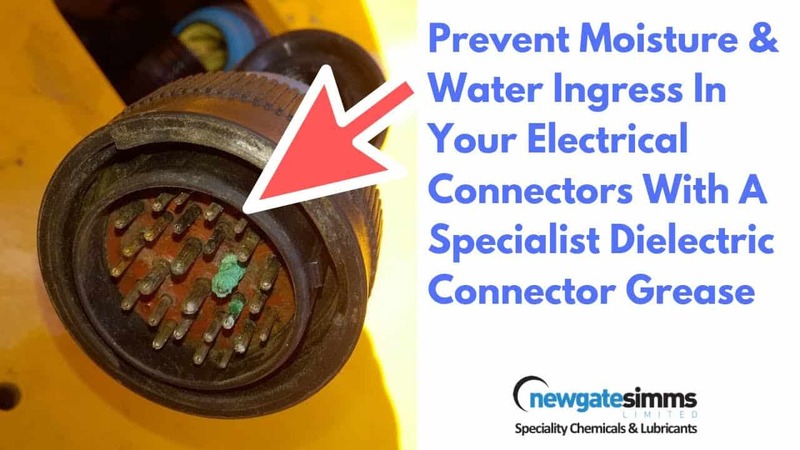 If water penetrates into any area of electrical contact, it is likely to cause a problem and electrical and electronic connectors are no different. Most connectors have some level of protection be that a sealed multi-pin, an IP rated connector or just a cheap terminal block; even spade and bullet connectors quite often have a plastic coating or insulation around the exterior. 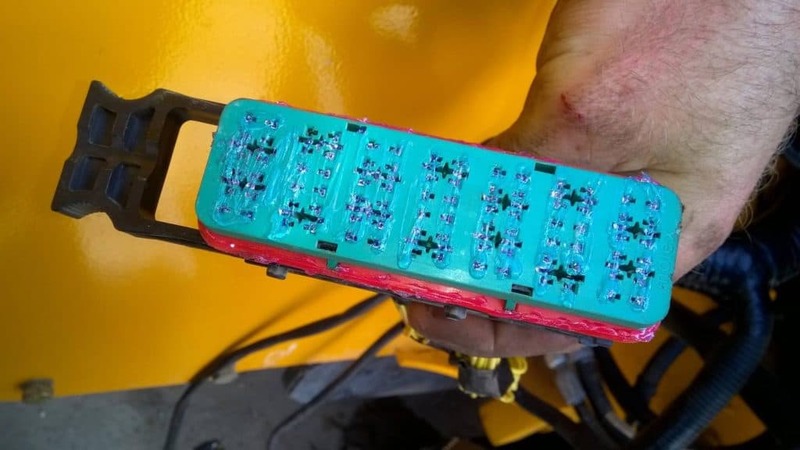 However even a small level of moisture ingress can cause circuitry problems and build up over time will eventually cause corrosion and the connector will fail. 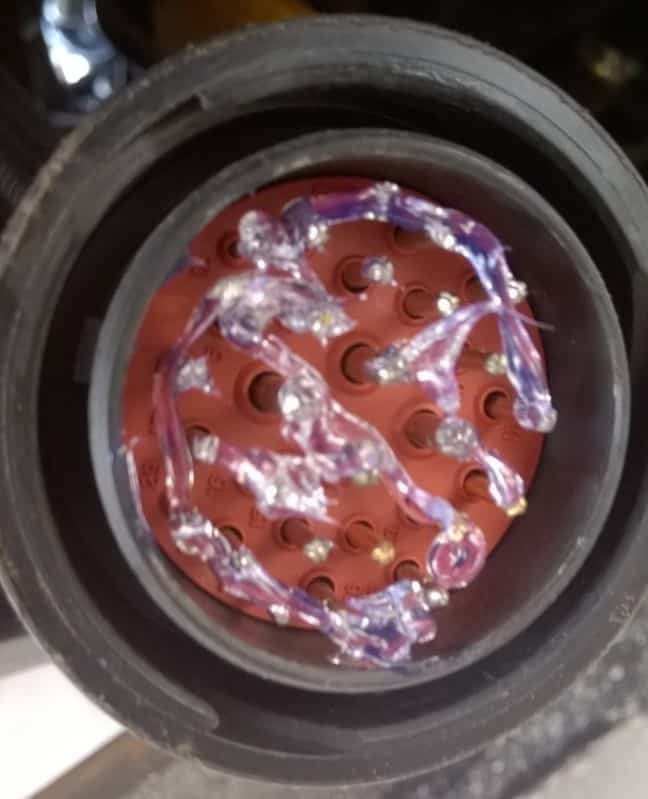 By way of illustration, here is a recent connector problem that a customer presented to us. 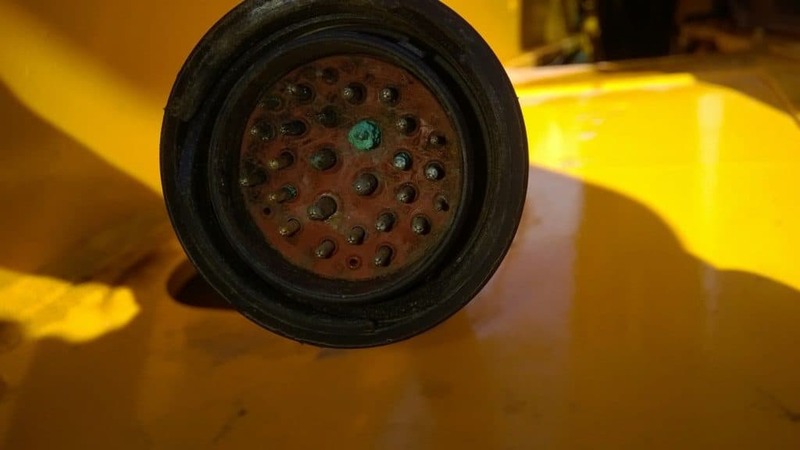 This 12 volt IP rated circular connector is used on industrial excavator and earth movers. 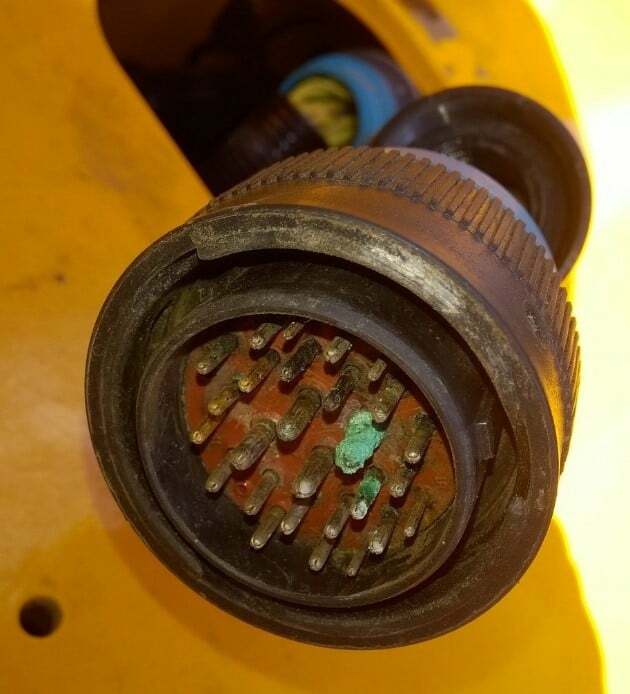 Despite the IP rating there was moisture penetration through the rear of the connector, you can see the resulting corrosion. So how is this solved? A specialist dielectric connector grease is the solution. 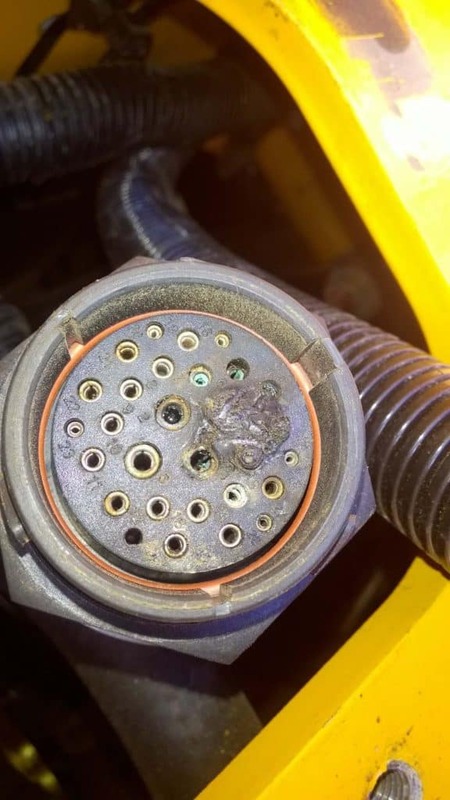 It’s important to point out that the addition of a specialist dielectric connector grease cannot repair such damage, connector grease is a preventative measure not a magic repair to an already damaged connector. Maybe you think a conductive grease would help repair the problem? 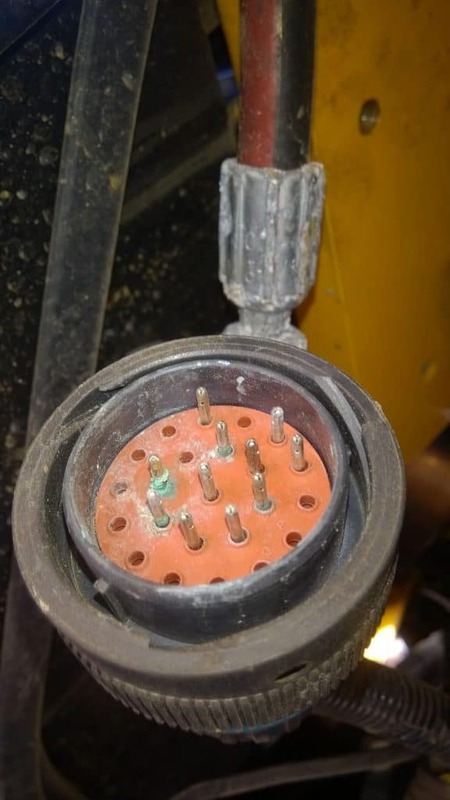 We advise you should NEVER use conductive grease for connector applications. The use of a conductive grease in connector applications will potentially introduce problems and make matters worse. Before we tell you about the recommended product for water ingress, let me first help you understand the term dielectric in the context of a grease. A dielectric grease does not conduct and it does not insulate, the grease sits between the contacts surfaces and seal the contact area, protecting it from moisture, oxidation and other contaminants. Providing contact forces are sufficient, a dielectric grease will not cause increased resistance across the connector. 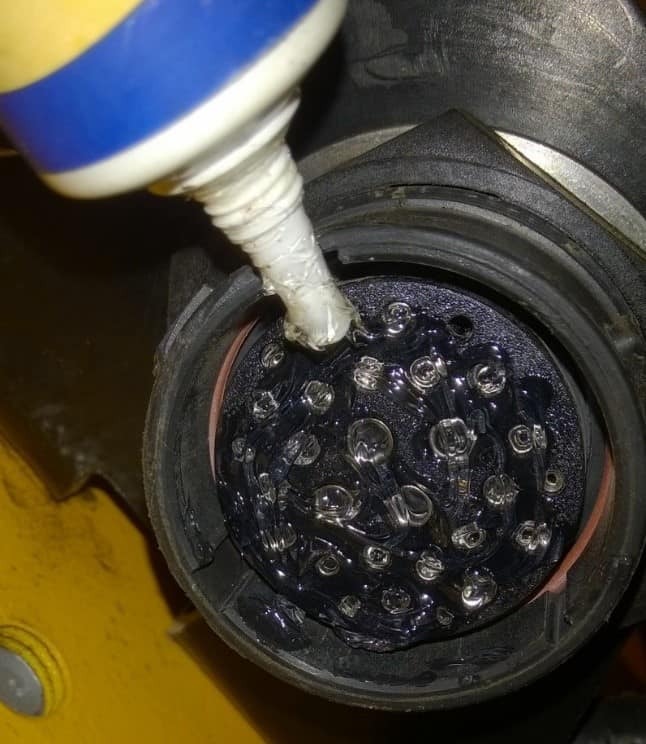 If you want to know more about how dielectric grease works, take a look at article How Electrical Connector Lubricants Work. Ok, back to the solution for this moisture ingress problem. 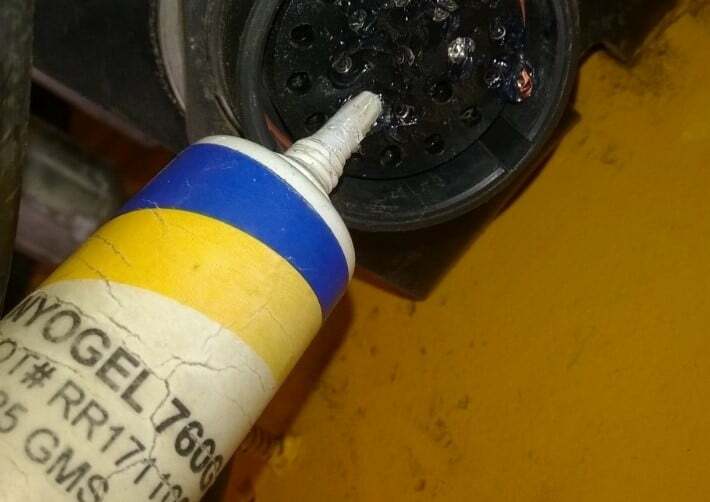 To prevent water or moisture ingress in your connectors, we recommend the use of the specialist dielectric connector grease called Nyogel 760G. Nyogel 760G has a pedigree in a number of market sectors as the ‘go to’ grease when protecting electrical connections/connectors. Particularly relied upon by a number of automotive suppliers and manufacturers, the 760G grease will resist water and salt water, it will also prevent fretting corrosion and contact wear, improving reliability and extending the functional life of the connector. The grease is fully synthetic, it will not dry up or evaporate away. 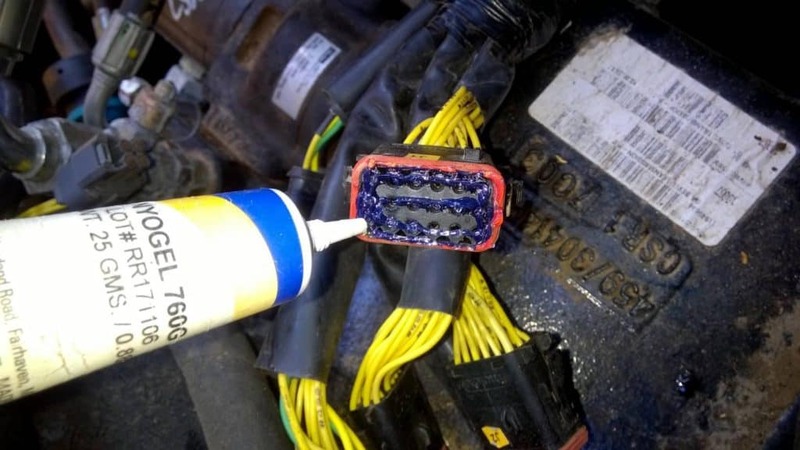 Unless you are un-mating and re-mating a connector, you shouldn’t ever have to re-apply the grease….just fit and forget, or ‘lube for life’, as we like to say. Nyogel 760G looks like clear gel but is classed as a grease. The base oil for the grease is Polyalphaolefin or PAO for short. PAO is ideal for use as a connector grease. We sell our 760G to a number of automotive companies that do no allow silicones in their assembly plants as silicones have a fantastic ability migrate and contaminate easily around a factory and they can cause problems, most notably in paint shops. In electrical applications, silicones can polymerise into hard, brittle material which can cause electrical problems and sometimes weld connectors together. The viewer may disagree with our negative view of silicones in electrical applications but decades of experience and the approval of this theory by most of the automotive suppliers and major manufacturers around the world is the best evidence to show this is a widely approved policy. Back to information about the Nyogel 760G composition…So a reminder that the base oil is Polyalphaolefin. The thickener used is Silica. Not to be confused with Silicone – they are a thousand miles apart. The silica used is hydrophobic, which gives the grease it’s excellent water repellency characteristic and indeed the grease will resist water spray or water washout. There are some aspects of the formulation we would not disclose. One of the additives we are happy to give details of is the UV dye/UV tracer that is included in the formula. 760G is hard to see in think layers and so a UV dye is included in the formula to aid inspection or check for the presence of grease post application. If you are interested in finding out how a grease is composed or what makes a grease take a look at our video about The Three Components of Grease(opens in new tab/window). Treating a connector with Nyogel 760G will keep it safe from water ingress. We obviously don’t recommend you’d fully submerse your connector in water but it will weatherproof a termination. Take a look at our Nyogel 760G Water Resistance Demonstration Video(opens in new tab/window). An application of Nyogel 760G on each contact surface is advisable. In this example some 760G grease is squeezed into the female side and some blobs are placed on the male pins ready for insertion into the other side. In theory, you cannot over use 760G provided you can mate the connector as normal. Common sense applies; where the connector is IP rated and maybe has a gland at the back like in this example, you should not overfill with grease as there is nowhere for the excess to escape when the connector is mated. Many connectors are not sealed and so any excess grease will squirt out at the rear of the connector when mated. One thing to consider when using a grease on connectors is the exposure of the plastics to your chosen lubricant. Sometimes grease can cause problems with plastics and rubbers but 760G is widely used and it’s unlikely there will be any compatibility issues with the typical materials used in connectors. If you want to know more, take a look at our article – Lubricants and possible plastic or rubber compatibility issues. Nyogel 760G can be purchased in small amounts at our online shop and is available in handy small tubes such as 25gram and 100gram. We also sell the grease in bulk to component manufacturers. Get in contact if you have a potential high volume or bulk application for Nyogel 760G.